A few weeks ago I was searching the internet for some of my usual polish "wants". 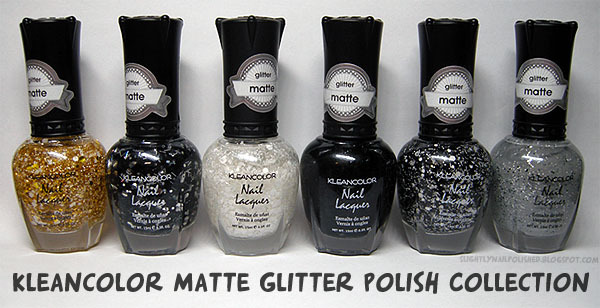 For a while now I've been on the look out for some reasonably priced matte glitter polishes. I'm cheap (and not afraid to say it) and the thought of paying $10 for a single bottle of polish is out of the question and mind-boggling to me. So when I spotted a set of matte polishes by Kleancolor on eBay for $9.99 plus shipping, I decided to jump on them! 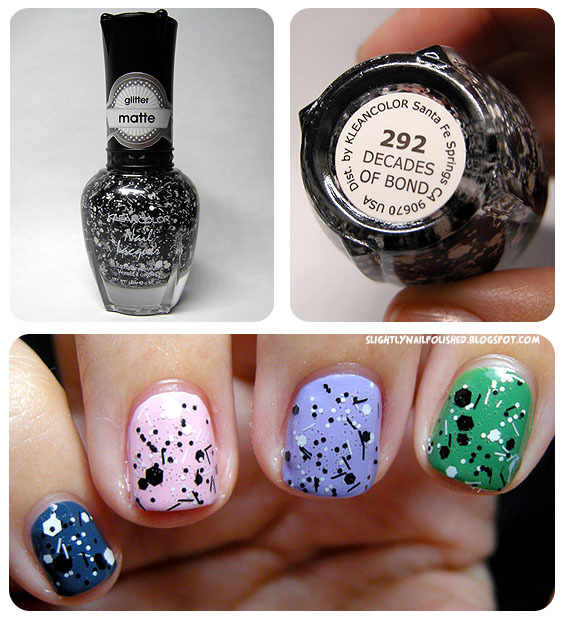 There are 6 polishes in this collection, each with a different mix of matte glitters. The collection contains: Everyday Is My Birthday, Score High Spend Low, I Do Romeo, Beyond Space & Time, Decades Of Bond, and Yogurt Raisins. I'm not sure when this collection came out or even what it was called... But I can tell you each bottle contains .15 ml/0.5 fl. oz of product! I decided to swatch these glitter polishes over some basic, every day colors. You know, just to give you an idea what they look like over different colors. Starting ay my pinky and moving in, the base colors I used are Natty by Zoya, Something Sweet by China Glaze, Tart-y For The Party by China Glaze and Starboard by China Glaze. All swatches show 2 coats of the base color, 2 coats of the glitter (unless otherwise stated), and one layer of topcoat. Everyday Is My Birthday is a clear-base polish with a mix of large, medium, and micro Gold hex's with some large and small matte white glitter hex's. There is also some matte white and gold bar glitters in there! I didn't expect to like this as much as I do. It was the easiest to apply with no bubbles. 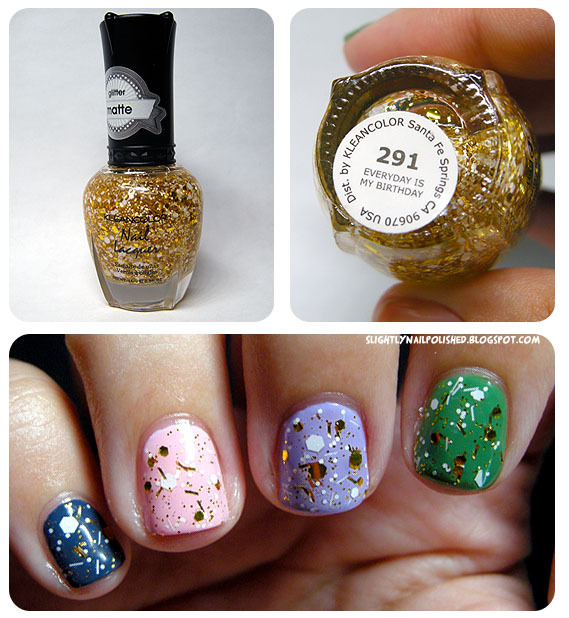 I love the bright, yellow gold of the glitter and it looks great against all the swatch colors. Score High, Spend Low is a clear-base polish with a mix of large and small silver hex's, large and small matte black hex's, and matte black and silver holographic bar glitters. It's a great glitter polish but I would have liked it 10X better if there were more holo bar glitters in it. I really had to fish those sucker outta the bottle and even then I could only get 2 or 3. I Do, Romeo is a clear-base polish with a mix of large and small White matte glitter. This mix was one of the main reasons I bought this lot of polishes. Needless to say, I had great expectations for it. So it saddens me to say that it was a little disappointing... only because I had a major problem with bubbling. It drove me nuts. Maybe I applied it too liberally? I dunno. I'll have to try this one again to see if I can bring those bubbles down to a minimum. Beyond Space & Time is a clear-base polish with a mix of large and small Black matte glitter. I had bubble problem with this one too, obviously. It's also worth nothing that the "clear" base is a little dark. I dunno if it has something to do with the black color from the glitter bleeding into the base or what but it is a little black. You can't really tell on any other color but the pink. It just looks a little dirty over light base colors. It's a great glitter, though if you use it over medium to darker shades! Decades Of Bond is a clear-base polish with a mix of large and small matte black and matte white glitter as well as some matte black and matte white bar glitters. This is my favotire mix of the group. And, yes, there is some more of the stupid bubbling but I was willing to overlook it for now. I just really like the variety here. Yogurt Raisins is a medium grey jelly base with a mix of small matte black, silver and matte white glitter hex's. This one reminds me of flooring in professional car warehouses. You know, where they paint the floor a grey color them sprinkle flecks of color on the floor? Anyways... this one was a surprise for me because I actually like it! I didn't really expect much from it... but I was wrong. 3 coats were used to get full opacity. One thing I want you warn you about is the smell. These polishes have a very strong, chemical smell to them. I don't know if it's the suspension base they use or what but they don't smell like normal polishes. So when you're using these, be sure to work in a well ventilated area with a window or a fan. Overall, the collection has a nice mix of glitters. They're very versatile and can be worn over many different base colors. I did have a slight problem with bubbles, as I've mentioned many times in this post. I think it's best to dab the glitters on your nail slowly rather than overloading your brush. You also have to work with the glitters, nudging them around to get them into the right place and to fill in any bald patches. But that's expected from a polish with large glitters. The only real problem I had with this set (other than the bubbling and the smell) is that these polished do take a while to dry, even with a fast-drying topcoat. So I recommend taking your time while applying, letting each coat dry fully before applying more. 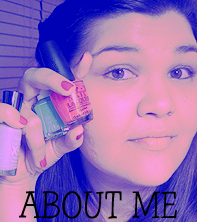 I would wait at least 5-10 minutes between coats, then wait a full 15 minutes before applying topcoat. Even with this advice, they will remain slightly tacky for a while, but they WILL dry and look beautiful. I'm very pleased with these polishes and with some work I think I can get the bubbling down to a minimum. I really like that these are affordable and relatively easy to work with. In case you're interested, HERE is where I got my set. Why don't you try them out, too? I just saw these on eBay and was thinking about getting them. Thank you so luck for your helpful post. Awww. ^_^ Thanks! I noticed when I bought them that there weren't any reviews for these polishes on the net and I needed to change that. I just got this set in the mail, luckily they don't seem to smell as reeky as the other Kleancolor polishes I have, though I haven't used them yet, only opened them, but whoo, that's usually enough! lol! I saw them while searching for a black glitter polish and came across your review as well. You definitely helped me decide to buy them, thanks for the review! And thank you for the wonderful comment. ^_^ You made my day! 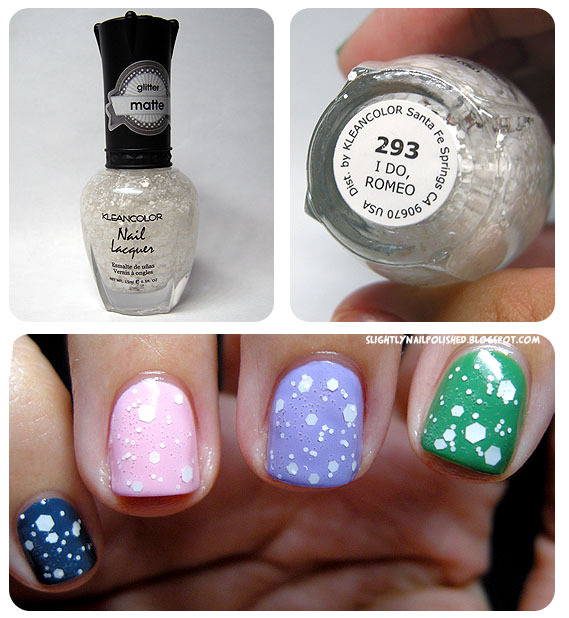 Nice post I love kleancolor you should try the 3d glitters they are beautiful.